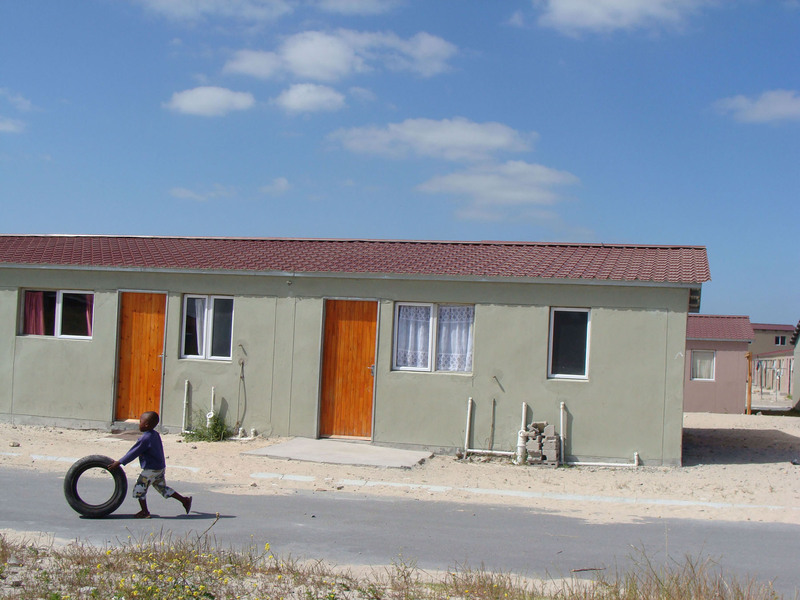 Housing minister Lindiwe Sisulu has officially handed over 1,000 new homes worth R160,000 each to their owners at a ceremony held in Delft outside Cape Town on Thursday 23 October. The handover formed part of the biggest single site residential housing development in Cape Town’s history, with a total of 4,750 homes being built in Delft, 35km from the city centre. But the development has been fraught with conflict. The handing over follows the invasion of the homes in December by backyard dwellers. A Cape High Court order in February evicted the invaders, many of whom now live in shacks along Symphony Way opposite the new houses. Damage to the homes, which form part of the government’s Breaking New Ground housing project, were then repaired and the houses allocated to the new owners, with 70% going to former occupants of informal settlements and 30% to backyard dwellers. Doreen Ngqwala, 52, the occupant of a new house with two bedrooms, a lounge, bathroom and kitchen, said she was excited and relieved to be a home-owner. “I waited for 20 years and today it’s all a dream come true,” she said. Ngqwala, a mother of three, said she was saddened, however, because her 90-year-old mother was still on the housing waiting list. Cape Town’s housing backlog has been put at between 350,000 and 400,000. The Breaking New Ground homes differ from the old RDP homes, coming in at 40 square metres compared to the 20-27 square metre RDP homes. About 500 excited people danced to a marimba band at the event. In her speech, Sisulu warned people who sold or rented out their homes and then returned to live in shacks that they would be arrested. Sisulu said schools had been built in the area, with community centres and food gardens to come. She said next month another 1,000 homes would be handed over in Delft Precincts 7-9, which is opposite Delft Symphony, where yesterday’s houses are located. A total of 4,750 homes are on the Delft 7-9 schedule, with half that number in various stages of completion. A small crowd not consisting of new owners gathered near the ceremony demanding houses, but Itumeleng Khotsoane, housing department director general, said people should speak to the government and councilors rather than trying to “jump the queue”. “They are wasting their time,” said Khotsoane. We moved in Roosendal 7 years ago. The man who sold the house to us is not the owner, but the owner rented the house to him, and the house was in a bad state. There was no toilet pot, the walls were written on, and the man who rented the house had to put safety gates on. What I’m trying to say is the man sold the house to us for R6000.00 because he bought stuff to fix the house. He tried to get hold of the owner, but he failed because no one can get hold off this man. We stated our situation to the housing people that was there at the civic. They took our statement, but we never received any feedback. We have already fenced the yard for we have small kids, and renovated. What can we do, because this man is off the planet, we can’t find him.